Last saturday in Rome, three Neapolitan football supporters were injuried by gun shoots, while they are going to the Olimpic Stadium of the Italian Capital for the final game of Coppa Italia, the National Soccer Cup). For one of them, Ciro Esposito, the bullet hit the spine and he could not more walk. The shooter is Daniele “Gastone” De Santis, a 48 y.o. notorius leader of Roman supporters, frequently tried, but never convicted. Everything had started with the ‘bad idea’ to use of a parking lot – known as meeting place for Roman supporters and extreme Right skinheads – to park Neapolitan’s cars. Especially if the owner of the kiosk is Daniele “Gastone” De Santis, which in the past had helped to stop an important football game in Rome with heavy risks for people in the stadium. In the pictures published by Il Mattino, the most important newspaper of Naples, a group of Roman thugs assault a coach of Neapolitan fans: “They launched two bombs against the bus, we were afraid and asked for help to Ciro and other fans, so the clashes started”. So the thugs escaped, but “Gastone” tumbled and, showy reached by the mob, pulled out a illegally detained gun, exploding 4 shots. One shot in the chest (and spine) of Cyrus, the other two injured other Neapolitans at limbs and with the last blow he struck himself in the leg. Only after the shots, “Gastone” is reached from the crowd and severely beaten, as Donatella Baglivo – director and manager of the Ciak, the club which is part of the parking, and his first rescuer – testifies as a crowd was on him but she does not hear the shots and if they were a lot, as she says, namely that there was no intentional kill, since “Gastone” was beated and not lynched. 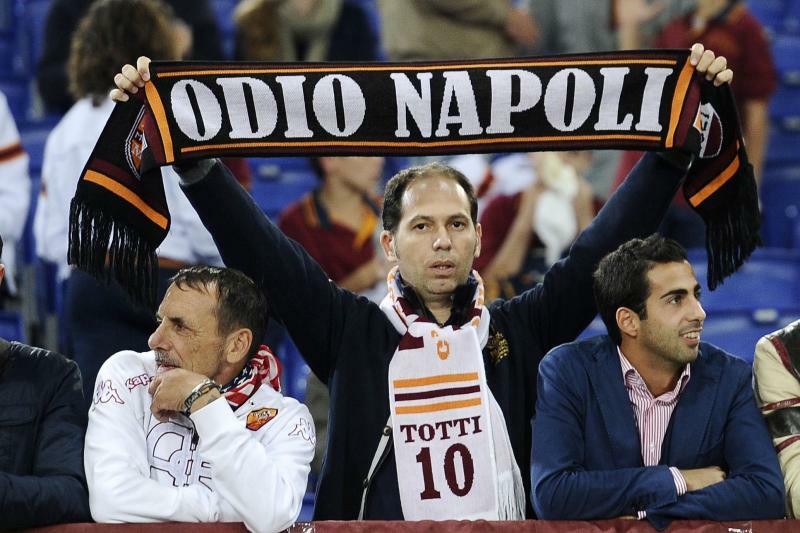 After this criminal action, through Neapolitans came to Rome for the game, anger, rage, tensions start to grow. Limited clashes before to entry, but the behaviour of the Neapolitans in the stadium was nervously calm: they retire the flags and almost silent await official and ‘sure’ news of what happened … also because the media kept saying that it was not a clash of fans, but by common criminals, while people knew ‘in real-time’ that was not so … and while – as media explained later – the game could not start ‘however’ because teams buses had arrived late, for the chaos after the shooting, and the players were not yet ready. During 40 long minutes, we saw on television lost looks of the highest offices of the Italian State – to present the final award – and a tattooed man that emerges from the – shocked, indignant, worried, resigned – Neapolitans crowd and speaks for her. His name? Better the nickname: he is Genny the carrion, leader of Neapolitan downtown supporters, son of a camorrist. A rude man who – in ‘that’ situation – had the power to impose calm to the most angry fan groups, armed with strong firecrackers, rockets and occasional weapons. And – by television – we have seen he tried to stop a first and powerful launch of firecrakers, smoke bombs and flares, when the police approached the stands, and he – at the second attempt and with the beloved captain of the football team, Marek Hamsik, at the head of a public officials team – lifts thumb (signal that the fan in the hospital was not life-threatening), and the game begins with a calmer mind for everyone. At this point the ceremony involved the Italian anthem and, as happened at other times, massive boos rise from the Neapolitan stands. Yesterday, we would have expected titles on media such as Rome out of control, the absence of the politics, citizens insecure, racism against Napoli, etc. Elsewhere, but not in Italy. Few news on Daniele “Gastone” De Santis, the shooter. Still, someone should at least explain us his ‘career’, begun 20 years ago, when he was also accused of having been part of a supporters commando outside the Rigamonti stadium of Brescia. Especially if De Santis was acquitted for not having committed the crime and received a compensation of two million and 900 thousand lire. Institutions have not to talk with Camorra to have the permit to play the game, this the sense of ‘general indignation’, but in Olimpic Stadium – as anyone could see on last saturday night – there were just Neapolitans, as the Prefect, as Genny the carrion, as 3-40.000 worried supporters. Tv pictures have shown no negotiation, but a short talk, as can be seen from the general relief that Neapolitan fans will the game goes on. Hard to believe, but Cyrus and the two other slightly injured Neapolitans are under arrest, accused of fighting, and on the front page of yesterday news we can read on Secondigliano and the Neapolitan Camorra. But not about Rome and its dangerous suburbs, Roman supporters and their usual devastations, shortcomings of the municipal police, the large amount of buildings and public spaces occupied / camped, the level of insecurity of citizens, a more proactive system of justice … until to the notorious Roman malpractice, if – as seems – the injuried had to wait more than one hour for the first aid. Meanwhile, for the first time in Italy, a person was shot by only reason of being a Neapolitan. Proud to be Neapolitan. Twenty years ago, arriving in Rome, I was sadly surprised by the words ‘I hate Naples’ that stood out in plain sight in front of a high school site in the district – leftist and Romanist – of Testaccio. Surprised because no one even dreamed of deleting that letter, and remained there for years, as were everywhere banned those anti-Semitic or xenophobic. 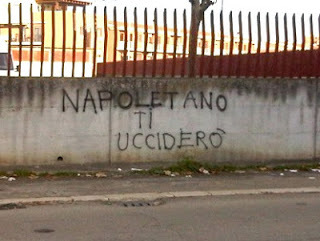 Racist graffiti that fomented hatred against Naples and Neapolitans, tolerated in the Italian capital – in its schools – for nearly twenty years, while, further north, the continuous mockery and denigration of the Neapolitans were regarded as ‘humour’. It is not a coincidence that the worst thing that happened in Rome on Saturday, after the firings on the crowd and the blank stares of our institutions, were the offensive choruses that the Florentines fans have addressed the Neapolitans to provoke them. 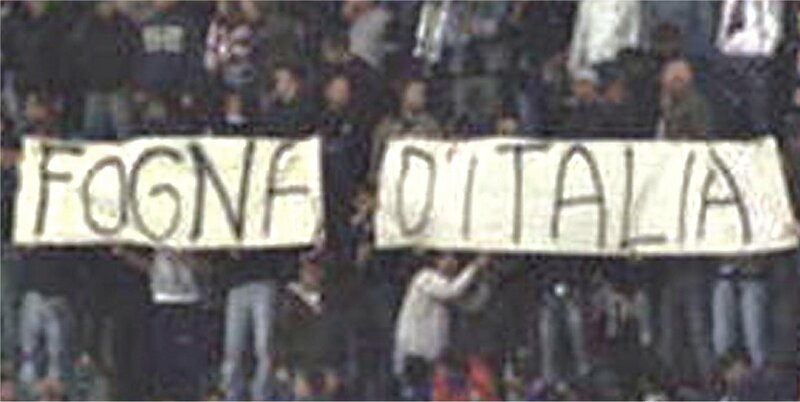 One more time, as usual in our stadiums. Even worse if politics and media will attempt to manage the ‘story’ as ‘kindly Neapolitan and not just Roman’. It is not (only) a question of hooligans or of new (more sure) stadiums. Not just the beloved public contracts and the ‘heavy’ gains by brand merchandising. Daniele “Gastone” De Santis – maybe – did not an ‘hate crime’, but to ignore the causes and the developing of this escalation could be an important vector for ‘hate’ and ‘crime’. A Parma una bambina di pochi anni è stata affidata a due uomini cinquantenni, una coppia omosessuale, con l’apporto favorevole del Centro per le famiglie del Comune, del Polo socio-sanitario, degli psicologi dell’Asl, del giudice tutelare. 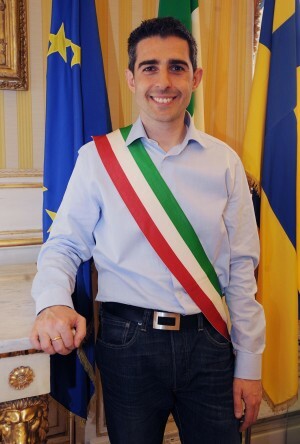 Da Scelta Civica all’ArciGay, passando per il noto Giovanardi, il dibattito imperversa, ma nessun commento arriva nè dal sindaco di Parma, Federico Pizzarotti del Movimento Cinque Stelle, nè dal presidente della Regione Vasco Errani e dall’assessore alla Sanità Carlo Lusenti. Eppure il Centro per le famiglie e la Asl che hanno eseguito la procedura amministrativa, inclusa la selezione dei potenziali affidatari, da loro dipendono. Una decisione che lascia davvero molto perplessi e per motivi molto lontani dall’omofobia. Innanzitutto, l’età degli affidatari (50 anni circa) e della bambina (4 anni circa) che appare davvero proibitiva anche nel caso si trattasse di un figlio partorito o, comunque, adottato. Non a caso, per l’adozione esistono leggi che fissano in ‘non più di quarantacinque anni l’età dell’adottando’.Dunque, la bambina, per decisione del giudice tutelare di Parma, è destinata a crescere con due ‘nonni’ anzichè, come la legge vuole, uno o due ‘genitori’ (single, sposati, conviventi eccetera). Ed è destinata a dover comunque cambiare famiglia prima o poi, se c’è speranza che venga adottata. E questo pone in luce un’altra questione: la difficoltà e le spese esose che tante coppie sposate (e dunque tutelate dalle norme vigenti) devono affrontare per un’adozione o un affido. Possibile che non ce ne fosse una, con una decina di anni in meno dei due affidatari, in tutta l’Emilia Romagna. O, peggio, possibile che non di fosse un/una single (etero o omosessuale che sia), sempre di almeno una decina d’anni più giovane degli anziani affidatari? C’è poi la questione dell’omofobia al contrario. Prima o poi doveva accadere. Due fratelli cinquantenni single e conviventi (con l’anziana madre magari) avrebbero avuto le stesse possibilità della coppia omosessuale parmense? E le avrebbe avute un iper-tatuato motociclista single dalla vita irreprensibile ed un’amante in ogni bar? Od una femme fatale che vivesse la sua libertà senza dar fastidio a nessuno? No. Non avrebbero le stesse possibilità di una coppia omosessuale. Come non l’avrebbe avuta una famiglia di immigrati e, forse ancora oggi, a Parma come altrove, di ‘veri terùn’. Lega Nord o Ku Klux Klan? Eppure, caro ministro, non sarebbero forse soldi sprecati. Anzi. Un referendum ‘contro l’integrazione’ avrebbe sia il vantaggio di smuovere le assopite coscienze di tanti italiani sia l’utilità di far uscire allo scoperto chi, dopo i meridionali, vorrebbe dis-integrare anche gli stranieri ormai italianizzati. Scriveva il Financial Times, in occasione della scandalosa ‘battuta’ sugli oranghi dell’ex vice Presidente del Senato e padre del Porcellum, Roberto Calderoli, che “il resto dell’Europa non può dormire sugli allori. L’austerity è un terreno fertile per i populismi. Il governo autoritario di Viktor Orbán in Ungheria è molto vicino ai fascisti antisemiti di Jobbik. In Grecia c’è l’estrema destra di Alba Dorata e in Finlandia ha i suoi “True Finns”. In Francia, il National Front è ormai attestato contro il centrodestra e il centrosinistra. Si sperava che London 2012 Olympics cementassero l’idea della Britannia come nazione aperta e, adesso, Mr Cameron ammassa voti con politiche che considerano gli immigrati scrocconi e succhia-welfare. 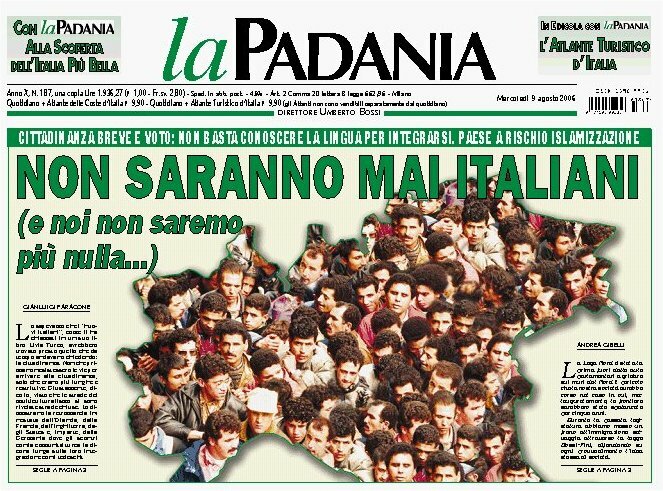 Per la Lega, dunque, i tempi sono maturi e deve decidere se diventare il Ku Klux Klan italiano od accettare l’opportunità politica di un centrodestra che ‘ancora’ la sostiene ed evolversi in un contesto politico multietnico. Dunque, la questione non è solo della brava Cecile Kyenge, ormai bersaglio continuo neanche si fosse sul set di Mississipi Burning, ma del popolo italiano tutto, se nel 2013 abbiamo ancora gente che ‘non affitta a meridionali’, arrivino da Roma o da a Capetown fa lo stesso. E non resta che chiederci come sia possibile che Matteo Salvini sia candidabile (o eleggibile, vedano lor signori) in rappresentanza del popolo italiano, di cui ne fanno per larga e larghissima parte i meridionali e tutti coloro che abbiano ottenuto la nostra cittadinanza. La Lega intende assicurarsi la palma di essere il neonato Ku Klux Klan d’Europa? 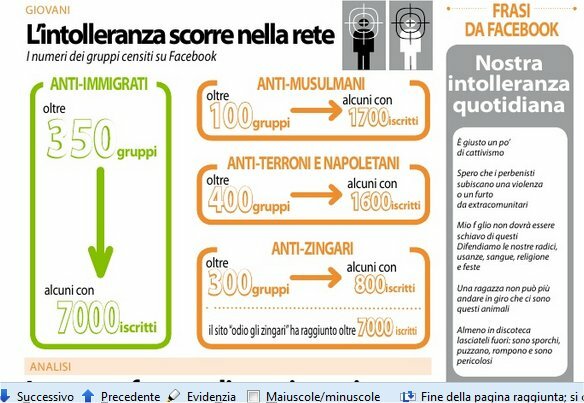 E quanti ‘veri italiani’ accetterebbero un immigrato come genero o un ‘diverso/a’ come parente? Che Maroni, Zaia e Cota facciano una scelta. La brava gente è stufa del razzismo bieco e delle battute da osteria. 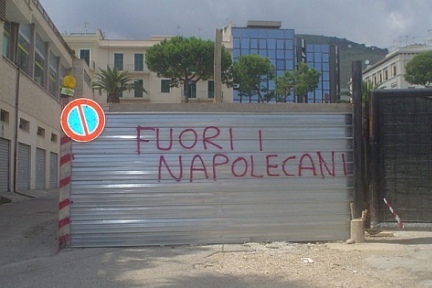 Ripubblico, in stralcio, un articolo (link) di Alessandro Citarella, segretario provinciale per Napoli del Partito del Sud . “E’ particolarmente interessante notare che esiste un fondamentale accordo, anche se tacito, fra gli attuali e i recenti governanti neoliberisti di centrodestra e quelli precedenti della coalizione pseudo socialdemocratica di centrosinistra, sia nella trasformazione in senso negativo della prassi politica, sia nella sottomissione degli interessi della popolazione rispetto a quelli della Banca Centrale Europea. La stessa entrata dell’Italia nell’Euro, eseguita con condizioni capestro e di sicuro svantaggio per i lavoratori e per i risparmiatori, è stata gestita proprio dalla coalizione di partiti della coalizione pseudo socialdemocratica di centrosinistra, la quale, almeno in linea teorica, dovrebbe essere più vicina alle classi più deboli. I pochi organi di stampa e le televisioni non in linea con il potere fanno battaglie in salita, specialmente a causa della concorrenza sleale fatta da sovvenzioni pubbliche generosamente elargite ai vari personaggi del sottobosco politico corrotto e corruttore, e da un drogaggio dei “mercati dell’informazione”, dove cambiando troppo spesso burocrazia e i relativi costi si piega o si elimina la concorrenza di quei soggetti inclini all’autonomia e all’imparzialità. “Non è un caso che l’Italia continua a scendere nelle classifiche mondiali relative alla corruzione e all’obiettività dell’informazione, ma è una precisa scelta di potere: portare il pubblico verso una rosa ristretta di testate televisive e giornalistiche fortemente orientate dalle proprietà verso un preciso quadro politico, distraendolo del tutto o in larga parte da scenari “socialmente pericolosi” per chi detiene il potere. In un quadro di forte interferenza nel mondo dell’informazione, diventa semplice creare notizie su persone e organizzazioni puntualmente pubblicizzate in maniera scientifica in precisi momenti, anche nella forma dei famigerati “dossier” che sembrerebbero, a prima vista, ben documentati, dando vantaggi strategici apparenti a una delle parti politiche contrapposte. In realtà il gioco delle parti, le finte opposizioni, i richiami a fantomatiche unità nazionali e a sensi di responsabilità servono solo a conservare il potere detenuto dai soliti noti, con l’obiettivo di emarginare e sopprimere quei movimenti realmente capaci di proporre cambiamenti alle regole del gioco e che vorrebbero restituire la decisionalità ai cittadini, togliendola a quel ristretto novero di “decisori” in cima alla piramide economico-finanziaria. E’ questa la stessa piramide che nel nostro Paese è stata responsabile della creazione della colonia interna chiamata “meridione” attraverso l’annessione forzata al Piemonte dei territori del Regno delle Due Sicilie 151 anni fa. Il massacro della popolazione e la spoliazione dei territori dell’ex Regno delle Due Sicilie hanno permesso che l’Italia “unita” seguisse un modello planetario dove ci sono un “nord” ricco e un “sud” colonia, cardine di un sistema di disuguaglianza dei diritti, dove l’uno non può essere uguale all’altro. Insomma, “liberté, égalité, fraternité”, ma solo per chi appartiene al “club”. “E’ necessario, pertanto, per un Partito che vuole difendere gli interessi delle popolazioni dell’ex Regno delle Due Sicilie, lottare a livello nazionale con forza contro i poteri che oggi cercano di ridurre lo spazio democratico ed eliminare la pluralità delle fonti d’informazione, perché questi sono gli stessi poteri che vogliono che il Sud rimanga una colonia interna.